Low Carb Smores | Happy National Smores Day! It's always camping season in the KetoConnect household, which means Low Carb Smores are always on the menu! We got a little creative with these delicious camping bites - no fire necessary. If you love graham crackers, chocolate, mallow and The Sandlot, you're going to love the recipe and the skit at the end of our recipe video. Check it out! Low carb, sugar free marshmallows are definitely not an easy thing to replicate, which is where we get a little creative. It's more of a marshmallow topping, that's easier to make and some might say even tastier. We use sweetened, whipped mascarpone cheese for a marshmallow replacement, and as a low carber of two years, it's really dang good! Why wait until it's cold or you're outdoors camping to make delicious smores?! You can have them indoor and right now. We've given you a super simple sugar free graham crackers recipe, as well as a straight forward marshmallow topping. All you need is some chocolate to complete your indoor smores and we know you have some in your kitchen! We used unsweetened bakers chocolate for our version, but you can use chocoperfection, chocorite, Lily's chocolate or even use a les﻿﻿﻿s percent cacao bakers bar to complete yours. Matthew and I love re-creating all types of recipes, from desserts to family dinners, but what we love most about what we do is making it possible for you guys. You're most likely not going to find us using obscure, unattainable ingredients and we always do our best to make things budget friendly. This low carb smores recipe doesn't fall short of those guidelines! If you love what we do as much as we do make our favorite recipes and email us your creations! We always recommend our Olive Oil Cake and No Bake Cheesecakes. 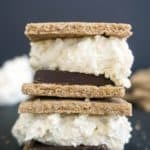 Once you've made those don't forget to test out these low carb smores and tell us what you think! Recipe can be quickly added to MyFitnessPal - Search "KetoConnect - Low Carb Smores"
Make the Sugar Free Graham Crackers and allow them to fully cool before using. To make the marshmallow topping, combine the mascarpone cheese and heavy whipping cream in a bowl using a hand mixer until you get a whipped, creamy texture. Add the vanilla extract and liquid stevia and mix with hand mixer one last time. Topping is ready and can be stored in the fridge. Place 1-2 pieces of chocolate onto a graham cracker. Top the chocolate with a dollop of marshmallow topping and place another graham cracker on top of the marshmallow to make your low carb smore! TIP: We like to use unsweetened bakers chocolate in our smores and two pieces yields 14 grams.